Higgs boson is like ... a Justin Bieber fan? It's like molasses! But sort of like the air! Yet it also behaves like fans of Justin Bieber! Everyone's talking about the Higgs boson, even though there's no really great metaphor for describing what it is and how it works. We know that this particle is responsible for the fact that matter - i.e. the stuff we are made of - has mass. Beyond that, physicists have to get creative. Scientists from the European Organization of Nuclear Research (CERN) said yesterday that they had discovered a new particle with attributes of the Higgs boson, a particle that had never been detected, but needs to exist in order for current theories about the universe to remain true. "It's an enormous celebration and everyone's incredibly excited to have found it, but this is by no means a gigantic surprise," said prominent theoretical physicist Nima Arkani-Hamed. In fact, Arkani-Hamed, who works at the Institute for Advanced Study in Princeton, New Jersey, said he was "dead certain" that the Higgs would be found, and would have staked a year's salary on it. "It's amazing that something so simple is actually involved," Arkani-Hamed said of the Higgs boson. For the public, however, it's not such an elegant idea: The theory goes that everything in our universe exists in a Higgs field, which is uniform everywhere. It takes a tremendous amount of energy to excite the field enough to detect a Higgs boson. If Higgs bosons were just free-floating, we wouldn't need a $10 billion collider to detect them, Arkani-Hamed explains. How can we visualize this? Imagine we are all immersed in an invisible molasses-like bath, physicist Brian Greene of Columbia University said earlier this year. As electrons move through the bath they experience a resistance, which corresponds to mass. "As far as the Higgs particle itself, it’s actually the tiniest nugget of this molasses-like substance," he said. Martin Archer, a physicist at Imperial College in London, explains it differently: He compares the phenomenon to Justin Bieber in a crowd of teenage girls. If he tries to move through them, they slow him down, and his speed decreases the more they're attracted to him. "We think we have found these teenage girls," he told CNN Wednesday. Similarly, if the universe is like a party, people who are relatively unknown will pass through the room quickly, while more popular people are slowed down by their friends, who correspond to Higgs bosons. OK, so how about detecting the Higgs bosons? Imagine air isn't something that you need to survive, but you want to know if there is air in the room that you are standing in, says Arkani-Hamed. If there's a piano in the room and you can hear someone playing it, there must be air, because sound needs air to travel through. You can think about the Higgs field like the air... or not. It's not as if a particle just showed up and said, "Hi, I'm a Higgs boson; sorry I'm late." More data is needed to determine what exactly the results mean. Scientists had to look for the particle's signature at the Large Hadron Collider, which operates in a 17-mile tunnel underneath the border between France and Switzerland. This $10 billion machine smashes protons together at unprecedented energies to look for indications of never-before-seen particles and other clues to outstanding mysteries about the universe. The results announced Wednesday were almost exactly what physicists had believed: The Higgs boson appears to be 125 to 126 times the mass of a proton, and has other properties consistent with the leading theory. But there are some aspects of these results that don't quite match up to expectations. The number representing the rate at which the particle is produced and decays seems to be one-and-a-half to two times too big. This could very well be a statistical anomaly that will disappear as more results come in at the Large Hadron Collider this year. Or, this could mean that there's about to be a lot of new physics to explain it. "It certainly adds a lot to the fun right now," Arkani-Hamed said. Of course, discoveries are always made in a messy way, and the results would have appeared more suspicious if they had been neater, he said. Physicists speculate that the early universe was extremely hot and not filled with a Higgs field, but the field formed as the universe cooled, changing phases the way that water solidifies into ice. There is no direct evidence of this, however. What else might the LHC deliver? As confident as Arkani-Hamed is about the Higgs boson, he's less certain that the Large Hadron Collider's will confirm supersymmetry. This is a theory that Arkani-Hamed works on personally. The basic idea is that every particle has a "super partner" with similar properties in a quantum dimension. It is possible that scientists will see evidence of these extra dimensions at the collider; supersymmetry could even modify aspects of the Higgs boson. Scientists are also hoping to learn new insights about the early universe, and perhaps even get indicators of dark matter, a mysterious invisible substance thought to be involved in galaxy formation. The Large Hadron Collider will continue operating until the end of 2012, and then come back online in 2014 after a two-year shut-down with its full energy of 14 TeV. "The common expectation is that we'd see the Higgs, ... and then we'd also see other physics," he said. "It would be a wonderful, extra surprise if we see new physics in the production of the Higgs." And here's one analogy that Arkani-Hamed and colleagues hate: the Higgs boson as a "God particle." That name came about because Leon Lederman reportedly wanted to call his book "The Goddamn Particle." But he shortened it to "The God Particle," a term that has become inextricably linked to the Higgs boson. This definition of New Thought / The New Thought Movement represents an excellenet summary from Wikipedia, and I agree wtih 98% of it. The other 2% – I believe that sickness can start in the mind and/or the body; not just the mind, and that “God” is a religous manufactured term and description of what is actually Infinite Intelligence, and therefore should be removed from the definition…. “New Thought promotes the ideas that “Infinite Intelligence” or “God” is ubiquitous, spirit is the totality of real things, true human selfhood is divine, divine thought is a force for good, sickness originates in the mind, and “right thinking” has a healing effect.Although New Thought is neither monolithic nor doctrinaire, in general modern day adherents of New Thought believe that “God” or “Infinite Intelligence” is “supreme, universal, and everlasting”, that divinity dwells within each person, that all people are spiritual beings, that “the highest spiritual principle [is] loving one another unconditionally … and teaching and healing one another”, and that “our mental states are carried forward into manifestation and become our experience in daily living”. The New Thought movement is a spiritually-focused or philosophical interpretation of New Thought beliefs. Started in the early 19th century, today the movement consists of a loosely allied group of religious denominations, secular membership organizations, authors, philosophers, and individuals who share a set of beliefs concerning metaphysics, positive thinking, the law of attraction, healing, life force, creative visualization, and personal power. Thank you for reminding me why I don't get my news from CNN anymore. Cronkite is probably rolling in his grave. How is something 126 times larger than a proton considered a subatomic particle? That is the size of Iodine. Please read: "The Higgs boson appears to be 125 to 126 times the mass of a proton". Mass, not size. There is a huge difference. Great discovery, might mean we can calculate its regression sincce there is almost a reverse reaction most of the time. wonder what would happen. Would you kindly explain what exactly was observed? How do you know this is unknown particle? What if it was not Boson, but rather compendium of 133 protons stuck together? Introductory Astronomy College Student Misconceptions. I. Galaxies". In it, three university professors explore the understanding of their students, and their misconceptions regarding galactic and extra-galactic astronomy in a 100-level course. 75-80% of students of an introductory astronomy course at the University of Maine – Orono went into the course thinking that: the Milky Way is the center of the universe, the Sun is at the center of the Milky Way galaxy, and the Sun is at the center of the universe. Just as frightening is finding that nearly as many students were of the impression that there are only a few galaxies, OR that the Milky Way is the only galaxy, as not. I think this begins to explain our low standing amongst the industrialized nations. What is being taught for science in this country's high schools? thanks, that's all i needed to prove my point! No. The point is that purposefully choose to be ignorant about science. And then you have the balls to complain that since you can't understand science, science is wrong, and scientists are lying. We see your ilk do this on every science thread. The Standard Model of Physics allows us to predict how things will work. This boson was predicted by the Standard Model, but we had not found it till yesterday. So finding it shows we are on the right track. That's important, cuz we had been wrong before. For example, if conclusive proof was found that ships fell off of a giant waterfall at the end of the world, then that would have supported the 'Earth is Flat' theory. When it didn't happen, it punched a hole in that theory. The Standard Theory describes 4 forces of nature: The Strong and Weak Nuclear Forces, Electromagnetism and Gravity. When we understood Electomagentism we were able to design all the electronic gear ever created as well as nifty things like the electric motor. When we understood the Weak Nuclear forces we were able to advance Chemistry because we knew how atoms bound themselves into molecules. When we understood the Strong Nuclear forces we were able to create Nukes and Nuclear power, both Fission and Fusion. The problem is that we have not understood Gravity. The Higgs Boson is the particle that imparts Mass, which causes gravity. Now that we've go a glimpse of how that works we may be able to actually manipulate Gravity. And being able to alter Gravity will allow us to do wonderful things like colonize the universe, accellerate close to the speed of light, etc. For example, if we can nullify gravity then and ENTIRE CITY could be lifted off of the earth and sent to a promising star system. Accellerate it to near the speed of light and suddenly you can colonize everythign within 10 light years in less time than we've been fighing in Iraq. And THAT is something worth doing! BTW: I vote that the first city we send off is Detroit. I grew up in that rathole and it certainly doesn't have much promise here on Earth. you really think Detroit should represent our planet? Or are you just suggesting a penal colony? TiredOfPaying: Thank you very much for your explanation. Found it very helpful. so find out what created this 'GOD' particle, and then what created that particle, and the next one, and the next one. sounds like the scientists have alot of FAITH in this discovery. how do we know that there aren't a bunch of scientists sitting in a lab, about to lose they're jobs, and one pops up with the idea to grab a box of crayons and start being an artist to get a paycheck?! this is so absurd! once again, the public is told something WITHOUT PROOF. if you want the average person to believe it, them explain it better! because just like 'justin bieber', i say, what's the big deal. and for all the athiests out there, you shouldn't be happy that this particle just 'came out of nowhere'! you should be ranting and raving that it is impossible, and demand that your belief not be jepordized about things being created 'out of thin air'! GOD BLESS ALL OF YOU ON YOUR QUEST! Wow, the lack of understanding in this post is amazing. First of all, nothing created this particle, just like nothing created an electron, they're just part of our universe. Next, it wasn't created out of nothing either, it took the energy from the largest atom smasher in the world to be able to pull this particle into something that we can test and see. And there is proof that this is real, although if you saw it I doubt you would understand it, not to say I would but these scientists do. Brush up on theoretical physics before you start bashing again. I think CNN should do a better job matching interviewers with interviewees. Then maybe scientists wouldn't feel the need to 'dumb down' their answers to the point of being a comedy. I very much agree with you on that. Good lord. These scientists are working with fermions and bosons, gluons, top and bottom quarks, charmed and strange quarks, quantom foam and entanglements, multi dimensional hyperspace. How would you suggest they dumb it down so you can "get it"? Your comment about the scientists sitting around drawing with crayons sums up your perspective perfectly. Because you purposefully choose to be ignorant about science, you assume scientists are lying to you. Yet you have no problem posting your drivel on the worldwide web. Which by the way, was invented by these same folks at CERN. Can you even spell hypocrite? The Higgs Boson is what is calculated as needed to understand and connect the standard model with quantum mechanics. That has been worked on by hundreds if not thousands of physicists and unlike political 'facts' is subject to peer review. They have plenty of proof, feel free to go look up what has been released by CERN. Would you rather see the raw numbers would that be proof enough? It's hard to accept the false teachings of man over the past couple of centuries, so the non acceptance of evolution by religious types is not surprising. The truth is hard to swallow, drinking the kool aide for all these years, then to have the air let out of your judgemental ballon. Hmm...I wonder if the LHC discovers something on December 21, 2012 – just before it's to be shut down – and destroys the Earth proving the Mayan Calendar correct? Yeah. I went there. I'll give you presents of 4 of July for all!!! July 5, 2012 – the day that will be remembered as the day on which CNN.com stopped pretending to be a news outlet. It is very unfortunate that to get people to read an article about science, they must use a pop culture ploy. This is sad. Not for CNN, but for our culture in general. It's not just our culture. Most people are not able to grasp reality beyond their immediate experience. To them all this is just fairy tales. Seriously? Get your atheism out of here. That's just it's nickname. Just a nickname??? Just a STUPID creationist nickname. Atheism is not going to "get out of here." This nickname is just one more example of deluded "believers" trying to muck up sound science. There is no god, so get your belief "out of here." and out of our government. Also, forcing a child into ANY RELIGION IS CHILD ABUSE. Higgs-Boson...Hale Bopp...this is what happens to physicists when they are unemployed at NASA, or need a job and have entirely too much time on their hands!!! Bosons are a category of subatomic particles. Higgs is the last name of the theoretical physicist who proposed the existence of the particle. Hale and Bopp are the last names of the 2 astronomers who identified the comet C/1995 01. Your post is an example of what happens when folks choose to purposefully be ignorant about science. As a scientist myself, this article name is insulting. They should take down this article, it's embarrasing for everyone, especially CNN. Idiots. I am not a scientist, but I agree with you 100%. Like a Bieber fan??? Does that mean they're all going to disappear and make no sound??? Sounds like a win-win to me! I'm officially finished with CNN. What in the Selena Gomez is going on here? I'd pass through them and when they start to acquire mass it's going to take a 10 billion dollar effort to find me. You, sir, win the internet for today. Agreed. Thank you for making my morning. Now THAT, sir, is funny. May the Flying Spaghetti Monster bless you with his noodly appendage. Pasta be upon thee. does this Higgs Boson constantly run into immovable objects also? I'll bet the Higgs Boson never knew it was lost. . .
No, it knew, it was just too stubborn to ask for directions. I fail to see how this is any bigger than discovering the atom or a quark.. It is simply the glue that holds it together.. And since we all suspected there was something that held it all together.. How does it explain the who or the what that brought it all into being..
Its just another scientific discovery of something that has been there for years.. Might help us move further along as humans..Travel further into the unknown.. But I don't believe it actually explains away a creator.. or proves it was one giant cosmic blast out of nowhere, and Wa La.. .We eventually came into existence..
We might actually find our selves meeting up with God one day.. Stepping through his front door~!! It is also the fuse. It is what ignited the big bang and allowed the universe existance in the first place. It is why it has been misappropriatley called the god particle (also due to publisher trolling). Nothing accessible can disprove a creator, but so far science has proven that anything they possibly did beyond the big bang was simply for fun and would have happened anyway on it's own. Creation of the stars, sun, moon and even life was automated and required no further input. Thank god for your bang, but anything further is just denial or poor understanding. It's important because we can concentrate out efforts in the right direction now, without a bunch of people saying pics or it didn't happen. By "Wa La" I'm guessing you mean voila? Congratulations to Scientists! We have made tremendous progress for Newton and Einstein didn't even spend such a large sum of money on their permanent achievements. IF IT HAS REALLY HAPPENED, THEN WEIGHT OF IF IT HAS REALLY HAPPENED, THEN WEIGHT OF EARTH WILL INCREASE AND SUBSEQUENTLY EARTH'S ROTATION TIME WILL INCREASE AT LEAST BY FEMTO SECOND. In the interest of true science, I must point out that the particles smashed already existed, therefore there is no 'extra' mass created. Nice try though. In the interest of Reality, I must point out that the earth is hit by approx. 300 tons worth of micrometorites and dust each day, so good luck with finding a single Higgs Boson in all that mess. It also 'evaporates' quite a lot of mass into space each day. In the interest of internet sanity, I must point out that Caps Lock IS AWESOME! How dare you compare one of the greatest discoveries in science to some pop culture icon. Faith is for people like you who do not have the intelligence or the curiosity to understand how G8d really created the universe. Pathetic loser. No one is trying to disprove god, just trying to prove how they think the universe works, if that disproves god then so be it, but no one is actively trying to disprove god. $10 billion, while it sounds like a lot, is not enough to give the 'social programs' you desire to everyone. In comparison, the monthly bill to air condition the tents for our troops in Iraq was $18 billion. So if you're looking to save some money for 'social programs' you might wanna start there instead. The rest of your rant indicates that you have not understood anything this article is saying. You glommed onto a nickname and made a whole bunch of wrong conclusions. Thinkin that the name 'God Particle' has anything to do with God is wrong. Then again, I bet you think that Federal Express is a Government agency that spends your tax dollars shipping stuff around the world. You just compared one of the greatest scientific discoveries of our time to a twitter fad. You should be ashamed of yourself. Tha why science writing for laymen is called popular science. They simply are using an analogy that will communicate the very basic idea to people who otherwise wouldn't understnd or purhaps have the interest to read. This is really only news for scientists. Everyone in this forum is a retard. "They’ve done a bunch of tests, analyzed the results, and while they didn’t find the elusive object itself, they’ve found an empty space where it WOULD be, if they could actually see it. So they can’t PROVE it conclusively, and you can’t see it, but you can infer its existence from how it affects the surrounding area. Which if you ask me, is a delightfully ironic way to describe something colloquially known as the God particle." The Higgs boson has to exist for current physics theories to remain true. 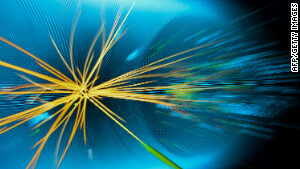 Scientists are claiming to have found a particle that fits the description of the Higgs boson. Where is the evidence, and can the experiment be reliably repeated? Until those questions are answered, nobody should believe anything. Particles and waves at the quantum level do not follow the rules of physics on a larger scale – probably because these particles and waves can travel into other dimensions that we can never observe. Who really cares. We llive our lives then die. End of story. And what is the difference between believe or not believe? Although your fine understanding, you notoriously play the game of the nonsense man. Let me know when in a lab man touches the sky! who cares, when I die I will find out one way or another. Frankly ridiculous. Man is nothing and nobody to try to affirm something that will not change anything nor add something to the vain and absurd human being's intelligence. Man dies ignorant. Such intelligence would need to be multiplied by zillions times to try to knowh a minimum of the facts of life. Something that of course will never happen. Man will never know more than what it is around the corner. He is not capable of learning the things that eventually could take us to know a minimum percentage of the whole true. Many do not know yet what is. Universe, what is cosmos. Many absurdily think that the space where earth resides is finite. What is even worse, many think that this huge type of matter was created by a god. Man in general is the stupidest product brought to life. A life that is utterly nonsense. To live to die is stupid and insane. So, men, please continue inventing things in a lab, so that you assure your paycheck. No offense toward the NASA experts please. The Higgs boson turned me into a newt! Wow CNN, way to lower the bar with this article. I want the 3 minutes I wasted on reading this article back. Readers should also know – The 'boson' in the Higgsboson particle, whose search and ultimate detection was one of the longest and most expensive in the history of science, owes its name to Bose. In 1924, the Calcutta (India) based physicist Satyendra Nath Bose had sent a paper to Albert Einstein, describing a statistical model that led to the discovery of the Bose-Einstein condensate phenomenon. The paper laid the basis for describing the two classes of subatomic particles – bosons, named after Bose, and fermions, after Italian physicist Enrico Fermi. This must be the most ridiculous 'article' ever written... what a completely pop cultured moron. Who names their daughter Justin Bieber? All this money spent. The answer is obvious, mass is given by Taco Bell, Burger King, Mc Donalds, KFC, pop, candy. Now that is a real and tangible problem. OK, got it. Found the God particle, now that you know it exists then find the whole thing. That's too difficult for me. so higgs is not concrete block of universe is just another particle maybe most popular one. and what the heck is love doing with higgs man!!! Everyone needs to keep in mind that there is TONS of physics behind what this particle is, what it does, and what it tells us. These dumb little video summaries that they release to the public (who they think are stupid) are just the tip of the iceberg. If you want to try and bash this discovery, you need to read up on modern physics and brush up on your understanding of mathematics before you can make an educated point. There was a group of religious Higgs Bosons gathering at the Great Hall. The tall one in the big red hat says "Its time to start the Mass". yes the question of what gives mass, but it is not the fundamental question; i think we get more questions! that's great. for one, when we know more about mass, we can ask what is gravity? mass. gravity. curvature of spacetime? extra-dimensional planes? string theory? branes? and then, what is a particle? or, why? and what is "underneath" particle? turtles :)? we keep going, keep asking, stay curious, that's what's FUN! I dont understand something. If the Higgs boson gives matter their mass, how can itself have mass? What gives the Higgs boson its mass? Other Higgs bosons? Don't ask questions, answers just rattle faith, you some kind of atheist or something? Why do Mericans have to explain everything like they are talking to 11 year olds. Because it's public media caters towards idiots, same as any other country but the USA just happens produced the highest quality, therefore you see it more often wherever you are. This saddens me because the idiots who watch it believe it. What would your country look like if we based it off it's media huh? LoL, typical American responses. It's no wonder your country is tanking and nobody can agree on anything. Please....keep this particle out of the hands of the U.S., pllllllllease! That comment makes you sound dumber than anyone else that made a comment here. It's not a particle to be had, it simply disappears soon as it's created. A while ago they told us that they needed more money for Fermi lab to find the top quark, and that was the last particle they were looking for. Then they came up with the Higgs Boson, and needed billions to build a new unit (CERN) in a beautiful location on the Swiss-France border (I guess that there was not enough room in Hawaii). By the way this cost U.S. jobs. They shut down Fermi lab in Batavia, IL, etxcept for the computer jocks looking at the CERN data. They ran it for a few weeks, and now they have likely found what they were looking for. But, wait, they are only 90+ some % certain, so they need billions more to run the darn thing some more to make it 99.9% certain. What a bunch of snake oil salesmen. Worse than the bank bailout (bank heist) of Bush that made $750 billion vaporize. who is 'us' and who is 'they'? the LHC evolved out of an existing, old accelerator (the LEP). this was the work of CERN – European Organization for Nuclear Research. Notice the first word? EUROPEAN – this is NOT the same group that built and ran Fermilab. The United States is NOT a member of CERN and we didnt build the LHC. as far as 'them' telling 'you' that the last particle we were looking for was the top quark, the higgs was proposed 3 years before they broke ground on what would eventually become fermilab. So maybe they didnt tell 'you' about this particle, but they told the rest of us. It's not his fault that his world is flat. Hmmm...sounds like they're hunting for bigfoot. Just another attempt by the leftist lib media trying to brainwash us! I could discover a particle in my garage and say it is the God particle just the same. If this is science, then prove it. Repeat it, explain it, and prove it, make it happen. Too easy to explain why they can't prove it, unlike Pee Wee when he wrecked his bike, you can't say "I meant to do that" when you prove the theory and create another universe. This is not a "God" particle because all it shows is that matter has mass. That is the secret of the universe? Matter has mass? Go ahead and discover a new particle in your garage and let us see how many people see it as credible and how many ignorant people say I too can discover a particle in my garage. The fundamental question is, what gives everything mass? This is one step closer to answering that question. Thank you Ravi. I almost lost it on that guy until I saw your comment. The fact is they DID repeat the experiment and that is why they made the announcement. Fermi-lab did theirs and the large Hadron did theirs and they match. Please READ more folks. Science is not a conspiracy theory, it requires patience and diligence and hard work. You do not understand science. Prove it? They have supercomputers storing and analyzing millions of iterations of the same experiment! Actually the guy called it the god d.***med particle.. Because it was so elusive and hard to find..... It was called the god particle to clean it up for the press. They collected over billions of data for evidence in the past few years. In the future, please do the research to get your fact straight before you berate.